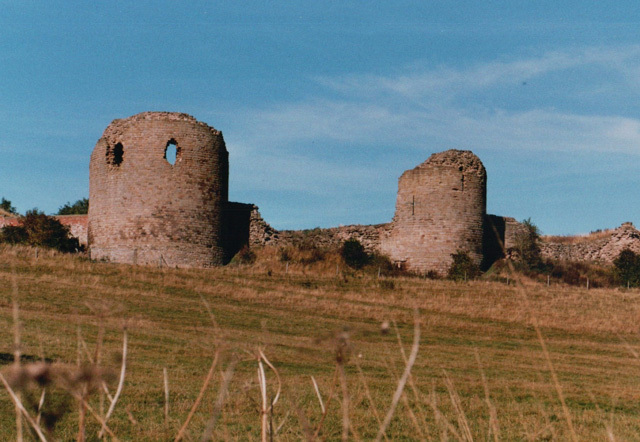 Notes: Chartley Castle lies in ruins to the north of the village of Stowe-by-Chartley in Staffordshire, between Stafford and Uttoxeter (grid reference SK010285). The remains of the castle and associated earthworks are a Scheduled Monument, the site having been protected since 1925. The castle itself is a Grade II* listed building. The motte and bailey castle was built by one of the early Earls of Chester circa 1100 as a safe stop over for their journeys to places like Tutbury. It was rebuilt in 1220 by Ranulph de Blondeville, 4th Earl of Chester, who died in 1232. It then passed by marriage to William de Ferrers, Earl of Derby. It remained in the Ferrers family for more than 200 years and in 1453 passed to Walter Devereux through his wife Elizabeth, the Ferrers heiress. Walter was created Baron Ferrers in 1461 and was killed at the Battle of Bosworth in 1485. The castle was then abandoned as a residence and Chartley Manor, a moated and battlemented timber mansion, was built nearby. Mary, Queen of Scots was a prisoner in this manor house. It was destroyed by fire in 1781. What is now known as Chartley Manor was in fact known as Chartley Manor Farm until the 1980s.